The Boy (there is not really a ten foot trout jumping up the waterfall.) My boy added that. On the wall of my bedroom is a picture. It was given to me by my Mother who took it, had it enlarged, and had it framed. It is on the wall where I see it first thing in the morning when I swing my feet to the floor and stand up. The picture is of a boy. 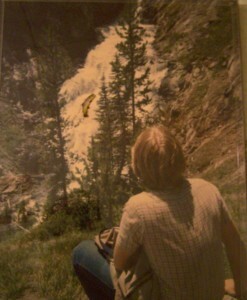 The boy sits on a rock looking at a waterfall. Because I know a bit of the history of the picture I know that the rock and the waterfall and the boy are in Yellowstone National Park. The boy faces away, always, with his back turned to the camera. He is pensive, silent. It is clear to me that he doesn’t know about the camera. He is oblivious to everything around him but the waterfall. Waterfalls can do that. The boy is a teenager. He is thin and gangly but not slouchy. He sits up straight (as his mother undoubtedly told him to) because he is a good boy. He is a good boy and he is a smart boy but his clothing reveals that he is not a “cool” boy. Here in the middle of a forest in the middle of a national park in the middle of the Summer he is wearing a button down shirt and blue jeans. His “cool” brother is undoubtedly clad in shorts and a t-shirt. The boy sits on the rock watching the water flow down through the canyon and he holds his jacket folded in his lap. He is calm, you might say serene. He seems at ease here in a way that he is not anywhere else. Being here in nature, watching the simple, eternal cycle of water evaporating up and running back down gives him a respite from the ceaseless barrage of teenage thoughts and the endless interior monolog in his head. Here on this rock he can forget about the compulsion to behave and to do well and to study hard and to achieve great things. In this place he can stop the flow of hormone-driven nonsense that colors his view of the world and the other people in it; girls, jocks, bullies, teachers, adults. I think the boy on the rock, in that moment, wishes he could stop the relentless flow of time and sit there, if not forever, then at least a little bit longer. I wake up every morning and I look at the boy sitting on the rock. There are times I wish I could talk to him. I wish I could tell him a few things that I know about the world but he doesn’t. I wish I could make his life easier. What would I tell him? I would tell him that a lot of the things he worries about just aren’t going to matter in a few years. I would tell him that some of the people in his life that he trusts or admires will let him down or hurt him. I would tell him what moves to make and perhaps what moves not to make in this great chess game called life. I would like to save him some grief. I would like to help him find more joy. Mostly I would like to offer him some valuable knowledge that he will otherwise acquire through pain and embarrassment. There is so much a teenage boy thinks he knows that just isn’t so. His certitude primes him for disappointment and mistakes. He needs somebody who has experienced the world to help him navigate this perplexing place. But he won’t listen. He won’t hear it even though he is a good boy. He didn’t listen to his Mom or his Dad. He had to make the mistakes on his own. He is a silly stubborn boy! All of us grizzled and jaded adults want to talk to the boy in the picture. We have seen suffering and we want to save him from it. We have tasted defeat and we want to rig the game in his favor. We have felt heartache and we want to help him dodge it. We want to trim the gristle off of life for him so he can enjoy the steak. But life is a marbled piece of meat. The good times and the bad times are inextricably intertwined. The people who give us the most pain are capable, at times, of giving us the most joy. Decisions which were clearly mistakes teach us something of value, even if it’s only the mundane lesson not to touch a hot stove a second time. And if we could talk to the boy in the picture would we really know what to tell him? Have we learned anything true from our own experience? Would we tell him how to avoid our fate? As I lie in this bed snuggled against my wife, the absolute joy of my life, or stand silent in the hallway in the middle of the night listening to the most profoundly wonderful sound I will ever hear, my children’s breathing, I’m not so sure. Would I dare lead the boy away from a path which might be difficult but which will ultimately bring him to the warm place next to his soul mate, a woman who loves him and understands him and forgives him? Would I dare divert him even one degree from the true course that leads here, to this quiet hallway, to this bed? When I consider, from the vantage point of age, what I would like to teach this boy about the world, I am troubled by a fleeting thought. What if the truth of the matter is this; I wish I didn’t know some of the things he doesn’t know. Sometimes I wish the boy could untell me things. I wish he could unteach me some of the bitter lessons I learned along the way. I wish he could teach me instead to trust people again. I wish he could help me forget all those things I know about the cruelty and greed and pettiness of other people. I wish he could teach me the pleasure of sitting on a rock. The boy in the picture never changes. He is fifteen years old forever and there is no way I will ever teach him anything. But there may be, just possibly, a way for him to teach me a few things by his serene example. Maybe if I study the picture I can unlearn the cynicism and sarcasm that separates me sometimes from the ones I love. Maybe I can learn to forgive the people in my life who have let me down or disappointed me. Maybe I can learn, from the boy in the picture, how to just sit on a rock sometimes and let the world flow around me like a waterfall.